Multitasking Enabled in iPhone 3G and iPod touch 2G in iPhone OS 4 ? Big news for iPhone 3G and iPod touch 2G users! After learning about iPhone OS 4 jailbreak news earlier today, some iPhone devs/hackers have now apparently managed to enable multitasking on the older iPhone 3G and iPod touch 2G, both of which were limited by Apple due to lower amount of RAM on these devices. This is what a recent tweet from an iPhone dev said. For those of you who don’t know, N82AP.plist is one of the two main files in the system directory which includes all the main functions of the OS that can be adjustable to ones liking. 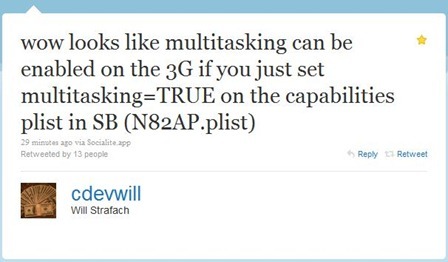 According cdevwill, there is this variable of multitasking which if set to TRUE from FALSE can enable multitasking on iPhone 3G. Now we are not sure if you can just go ahead and enable it just like that, or if it will require a jailbreak. Stay tuned as we will keep you updated. It was not allowed by apple for good reason….. by using multitasking on an older, slower model, the iphone/ipod will get extremely sluggish.. Tired of hearing about what “they” can do….”they” need to go on and release the jb to the public! the point is that should be to the user preference to have or not like having an on/off in settings. |Obviously apple want people to upgrade . They should release it Ive been waiting for so long!! Well either way, iphone 3G users will have access to mutlitasking. In fact multitasking has been available for the iphone for quite sometime now, and works pretty good on the iphone 3G. I'm just wondering what other features will not be included in the iphone 3G. Yeah right.. OS 4.0 is not even available to the public yet!!! say a dev has registered your UDID on their account.. how do you go about downloading the beat firmware? do you have to have a mac or can it be a windows? thanks. what if your iphone 3gs 3.1.3 (05.12.01) is upgraded to OS 4.0 when it is released would it be able to be unlocked then? is it possible that they will create an unlock for that? anyone else having any issues with multitasking enabled on a 3g device? every time i enable it, multitasking works just fine but after a few minutes my home screen goes blank. Enable the homescreen wallpaper on the same plist. U will be good to go.. your homescreen wont go blank when you launch any apps already opened from the dock. yes, you can downgrade back to 3.1.3 again. how do you get multitasking and home screen wallpapers on iphone 3G? How do you do the whole plist thing. I jaiilbroke my phone and the same thing happened to me where everything on my homescreen disappeared. Did Apple “fix” something in the final release that came out this week? Those keys don't appear in the N82AP,plist file on my phone. Adding them doesn't seem to make any difference. You have to restart (respring might work, but I recommend a restart) your phone after you change them.